This Matcha Coconut Vanilla Shake is such a sublime healthy treat. It’s creamy, rich, smooth and fragrant! I love everything matcha. Matcha is really the champagne amongst green teas. It gives off a subtle caffeine kick, which can boost your energy and improve focus and concentration. At the same time, it contains calming substances which can help calm you down and reduce anxiety. Matcha green tea powder boasts extraordinary health benefits. It delivers a mega dose of antioxidants. Antioxidants enhance immune function and equip your body in the fight against infections and disease. Now you can have your cake and boost your health too! 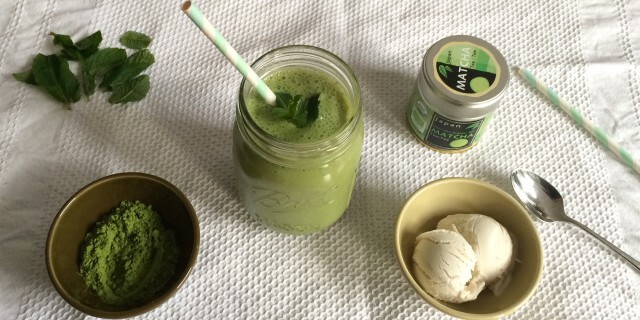 To make this Matcha Coconut Vanilla Shake, I love to use Booja Booja dairy-free coconut ice cream, Coconut Hullabaloo. I sometimes switch things up and use cashew nut ice cream, which is another great dairy free ice cream alternative. Both are delicious in this Matcha Coconut Vanilla Shake! Add all ingredients, except for the fresh mint leaves, to a food processor or blender. Pulse until thick, creamy and smooth. Garnish with fresh mint leaves and enjoy your Matcha Coconut Vanilla Shake right away!